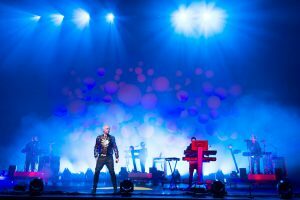 Nearly 30 years into a career of defining orchestral synth-pop, the Pet Shop Boys have returned to the record store shelves with Elysium, the 11th full-length (excluding compilations and soundtracks) by the duo of Neil Tennant and Chris Lowe. First conceived during a five-week writing retreat in Berlin, the sketches for Elysium were roughly sequenced on a mobile rig in hotels during a 2011 tour opening for Take That, then taken to Los Angeles for three months of sessions to achieve a consistent mood of “happy sad,” Tennant has said. Speaking briefly by phone, the two touch on a mid-tempo album that is more candid and contemplative than camp, but not without an arch, self-deprecating bite that is drawing comparisons to 1990’s Behaviour. To start I’d like to adapt a lyric from your recent single, “Winner,” into a question. “Looking back at all the times/we felt downcast/Didn’t think we were going anywhere/Just living in the past . . . But in that desperation, you get inspiration.” Do you personally find inspiration in reflection? Neil Tennant: Yes . . . I don’t know about desperation, but, like most of our albums, this album is inspired by our lives, and the lives of people around us, and the lives of the world around us. On this album, which is kind of unusual for a pop album, we’ve discussed growing old, actually. That’s what the song, “Invisible,” is about, for instance. It’s a mature-period album, as we write songs based on who we are and where we are and what age we are. What part does bringing in outside producers and mix engineers play in taking your current ideas from concept to completion? Your most recent collaborator, Andrew Dawson, has a considerable amount of experience engineering hip-hop . . . how did this impact your approach to frequency reinforcement? NT: Well, we always choose the producer who we think will help us to achieve the sound that we want. And on this album, the key track [that defined the album’s overall direction] was the song “Invisible.” When we wrote this song, which sounded pretty much millions of miles from the version on the album, we knew we wanted someone who’d give us some electronic sound with a lot of sub bass, but also keep the space in it. And we thought of that Kanye West album, 808s & Heartbreak, and we went to the credits of that and we saw Andrew Dawson’s name. So we decided to approach him and he was really keen to do it. So we arrived in Los Angeles with demos that had tons of work put in them already, and Andrew Dawson helped us improve the sound and finish what we’d already started. How did this hip-hop aesthetic cause you to compensate or change anything you’d already done, since all frequencies have to share a certain amount of sonic real estate? NT: I think if you look at the way the tracks are mixed . . . two-thirds of the album has an orchestra on it, and if we’d done that in London, mixed it in London, probably it would have been a very orchestral-sounding album. But Andrew Dawson has used–not in every occasion, but quite a bit, like on “Winner”–he’s used the orchestra as a texture, really. It’s not like a huge orchestral piece, which it quite easily could have been, actually. He mixes it much lower down than we would do in England. I guess that’s an example of balancing it in a different way. How have developments in recording technology impacted your approach to sound design equilibrium? NT: In the past you had to be more decisive. You had to make decisions that you had to stick to, as the way you recorded you’d have to bounce things together. Now it’s easier, because you don’t have to make those decisions; you can get so much stuff recorded on a computer now that you can kind of forget what’s there, as well. Actually, really, if I were honest, I would prefer to work on 48-track analog. I think, in some ways, it’s a more satisfactory recording process, because decisions are made and you know where everything is. Whereas, the way we do things now, there’s so much around you can lose stuff. You always lose it, because there are so many tracks. You go make 97 tracks and the decision doesn’t really happen until the mix. Is there also something in tape saturation that appeals to you? NT: Well, you did get that with analog. Our first album was recorded on digital, actually, and then it was bounced down to sort of a videotape thing. But after that, we used to record on digital and mix onto analog. So if you go to the EMI Pet Shop Boys vault, you discover all the masters of the albums are on half-inch tapes . . . and that went on until really quite recently, ’till 10 years ago I’d say. It sounds like the process over the years has gone in many different directions as you explored different transports and workstations. Is there anything you are a purist about? Chris Lowe: The constant is the song, really. And obviously the way that we realize the song changes over the years, because technology changes, but we really start with the song. We’ve never been purists about anything, we’ve always just used whatever’s lying around. When we first made “West End Girls,” there was an E-mu Emulator II in the studio and that was the only instrument we used for the whole song. So, I personally find when using electronic technologies that there’s always a new piece of equipment or a keyboard or something new that quite often generates an excitement or a new way of working. But that never takes the place of writing a proper song. NT: Also, I think we always like precision. We’re not looking for a human feel sort of thing, as people put it. As for the sort of sounds that have cropped up on every single, I think we always like a lush string sound. And there’s a sound which we got on that first recording session we ever went to on the Emulator that I believe is called “Voices I,” which is like a boy’s soprano voice or something. And I think it’s also on [Elysium], at the start of “Requiem in Denim and Leopardskin” it crops up. It’s a sort of key sound that seems to make something sound like the Pet Shop Boys. Also, the cowbell made it for certain onto this album on “A Face Like That.” Someone at EMI said, “I can hear the ghost of Bobby O” [New York-based pioneer of HiNRG, and a producer on the Pet Shop Boys’ initial “West End Girls” session] with the cowbell. He’s still very much alive and active, but it is something Bobby Orlando would have done. Beyond signature sounds, is there a traditional instrument or production tool from which a song starts? NT: One thing that’s changed the way we work is that Chris now does the programming, so there are just two of us in the room when we’re writing. It hasn’t been like that for over 20 years probably, as we’ve normally had a programmer in with us. So Chris has started doing the programming, and I think it’s changed the music slightly. I don’t quite know how to describe how . . . but it definitely feels like there’s something slightly more idiosyncratic that’s happened, which I think is a good thing. Having scored both a silent film [Battleship Potemkin, 2004] and a ballet [The Most Incredible Thing, 2010] in the past decade, has your relationship to movement and imagery changed any? Do you visualize song arrangements differently? NT: I think it must have had an effect, but remember that’s generally music with no lyrics, it’s music that’s meant to evoke something specific or a specific feeling. So it’s like a different medium, almost. I think it’s given us orchestral arrangement ideas that we might not have had. And also, of course, a lot of that is dance music and [Elysium] is not a dance album at all really. I can’t really work out what effect it’s had on us . . . perhaps it’s given us the confidence that we can write a continuous piece of music. The ballet is 90 minutes, quite an ambitious thing to do, and so it maybe broadens our horizons a bit.